Altitude Warning This trip goes to high altitudes where you may well experience the effects of altitude as your body acclimatises. 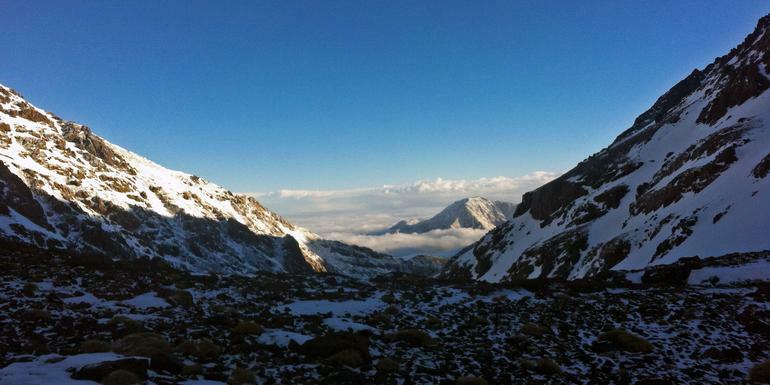 There is also a small risk of being affected by Acute Mountain Sickness (AMS). The correct way to ascend a mountain is slowly, allowing your body time to acclimatise to the altitude, which we do: but you should be aware that it is still possible for you to be affected. When hiking do not hurry, enjoy the scenery and give your body the chance to adjust. Should you experience headaches, nausea, dizziness or breathing difficulties you should speak to your CEO immediately and take advice on appropriate action. Local mountain gîtes: Gites are accommodation in family homes, or mountain huts, usually in mountain villages and are very, very simple. If you have this expectation in mind we are sure you will be pleasantly surprised. Sleeping arrangements are multi-share. Mattresses are provided. You will need to have your own sleeping bag and sleeping sheet, and bath towel. Bathroom facilities are basic and shared. Hot water is often not available. You will enjoy delicious homemade dinners of local produce, dining in a traditional manner, often sitting on the floor in a cozy salon. Camping: We sleep in modern two person tents which are easy to set up. Foam mattresses are provided for you to sleep on during our camping. If you would like more comfort please bring a light weight self-inflating mattress such as a thermarest. Pillows are not provided so you may also wish to bring an inflatable pillow. You will need to bring a sleeping bag and we recommend a lightweight sleeping sheet as well (for extra warmth or for when hot). Bathroom facilities are "au naturelle" We will hide our "hole in the ground" toilet with a tent, and ask that all toilet paper is burnt. 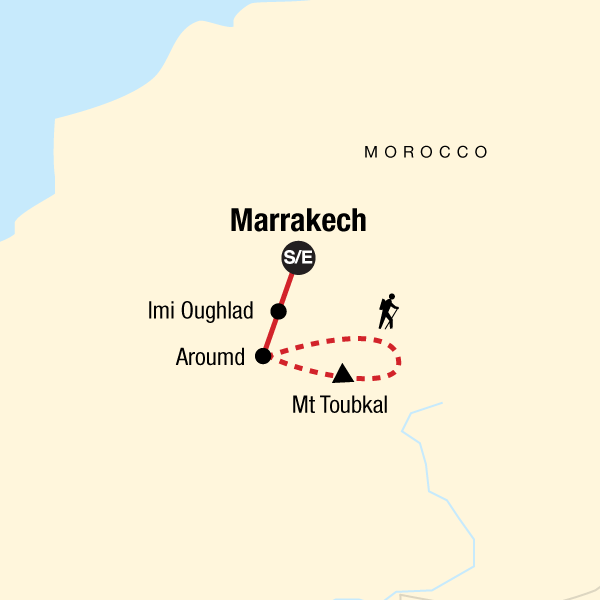 You can also make use the toilets and showers at the Toubkal refuge, but you will be asked to pay and often the camp is some distance from the refuge. Don't forget your flashlight/torch. Those worn as "headlamps" are especially useful. Hotel In Marrakech we will stay in a local hotel in the new town. This is approximately a 25 minute walk to the central medina. Please note that Morocco is a developing country and as such the infrastructure is not as reliable as you would expect at home. Expect quirky plumbing and the odd cold shower! On this tour many of your meals are included. You can expect simple, healthy seasonal food. Breakfast is typically bread, jam, cheese, sometimes eggs, accompanied by tea/coffee. Lunches are usually salads sometimes with eggs or tinned fish, always with bread. Dinners usually start with a soup followed by tagine,rice or pasta dishes, again with plenty of bread. We are able to cater for vegetarians. Please advise us of any other special dietary issues at time of booking. You are accompanied by a cook who, together with your CEO and mule handlers, will prepare your hearty meals during your trek. If you’d like to lend a hand and learn some of the local techniques, you are more than welcome! Water and other drinks are at your own expense. Your CEO will give advice about the quantity of water to take at the start of the tour, and availability of additional supplies during the trek. This G Adventures group trip is accompanied by one of our group leaders, otherwise known as a Chief Experience Officer (CEO). As the group coordinator and manager, the aim of the CEO is to take the hassle out of your travels and to help you have the best trip possible. You can expect them to have a broad general knowledge of Morocco, including historical, cultural, religious and social aspects. They will also offer suggestions for things to do and to see, recommend great local eating venues and introduce you to our local friends. We also use certified local city guides where we think more specific knowledge will add to the enjoyment of the places we are visiting - we think it's the best of both worlds. On this specific trip, your CEO will be an experienced mountain guide.